Manchester International School Connect (MIS-Connect) is a safe and secured database of school documents that reaches out to parents via internet with just a few clicks. With this information system, parents stay updated with current events, school documents and happenings in the school. Portal also allows each parent to have separate access to school and their student’s information. MIS Believes that parents & guardians are a key factor in their child’s educational and academic success. Therefore, they should be well informed about all events and publications related to the school and child in a timely and quick manner. Parent Portal is an online tool created for parents to access Manchester International School documents instantly via internet by entering secured information. It gives access to parents who can login using username and password- provided by the school. "I recently took admission for my two daughters for Grade – 5 & 7. I can happily state that the international programme (IB and Cambridge) taught in MIS is the best i have come across. Both my daughters adjusted well and are academically showing great improvement. 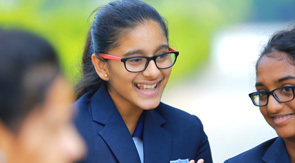 I would like to recommend to other parents the Manchester - rated always in the top IB schools in India."